Manufactured in Turkey, the Ultra Marine ANCHOR range is the pinnacle in anchoring technology and design. 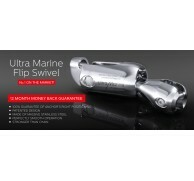 Completely hand made from 316 stainless steel and hand polished, every Ultra Marine ANCHOR is designed for excellence. The Ultra Marine ANCHOR demonstrates why a correct weight distribution and design is so important when setting and recovering your anchor. In fact, invert any Ultra Marine ANCHOR and it will instantly recover itself to the attack position. Such performance has been achieved with the innovative patented features this anchor displays; including a curved lead filled tip for instant penetration, a hollow shank for optimal weight distribution, concaved base surfaces for maximum holding power and large side wing plates to avoid release during changing wind or tide conditions. Furthermore, each anchor is easily recoverable with the flat pivot surface on the underside base. The Ultra Marine ANCHOR is suitable for all vessel types and locates securely onto the bow roller. Standard anchor sizes range from 5kg to 360kg with larger anchors available upon request. Sourcing Europe’s finest materials and fabricated by specialist engineers, the Ultra Marine ANCHOR is supplied with a LIFETIME WARRANTY against manufacturing defects under normal conditions and use.